Fuji's FinePix XP10 is a 12-Megapixel "tough" digicam with a 5x optical Fujinon lens and 720p HD video capture all packed into a case that is ready to take whatever you throw at it. At $179.95, this is one of the most affordable cameras on the market with these capabilities. Read more in our Full Conclusion. Fuji's FinePix XP10 is a built-tough camera made to withstand the rigors of the active lifestyle. With a water, shock, freeze and dustproof construction this camera can go anywhere and withstand anything that you can. Featuring a 12.2-Megapixel imaging sensor, 5x internal optical zoom lens, 720p HD video capture and SR (scene recognition) Auto, the XP10 has not sacrificed any of the features found on normal digicams. Fuji has made this camera available in 5 stylish colors: Black, Silver, Pink, Green and Blue. Fuji's features that make it capable of "Wild" activities is its ability to work up to 3m (12ft.) underwater. If water is not your thing, the camera is also able to withstand temperatures as low as 14°F (-10°C), falls from up to 3.3ft. (1m) and keeps dust and sand out as well. This allows the camera to go with you on just about any outdoor adventure with no worries. 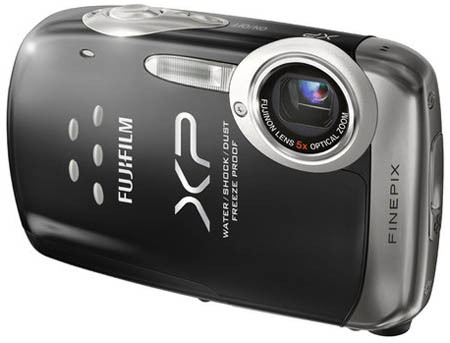 The Fujifilm FinePix XP10 is available now with a MSRP of US $179.95.